A memorial is an enduring testimonial, purchased only once, to honour a life through the centuries. Whether your need is a memorial for a loved one, or whether you are planning for yourself, we can show you exceptional designs, and guaranteed first-class workmanship, using only top-grade materials. 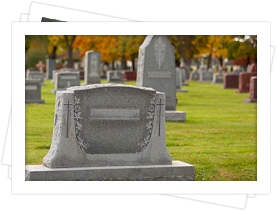 McLellan Funeral Home is a representatives for Aresenualt Monuments, we have found this monument company to possess the quality and level of professional service that we require and feel comfortable to pass onto our clients. You may browse their web site link for ideas and info, and if you would like to start the order process , see some examples in person, or just want further information stop in and visit or contact us and we would be pleased to assist you.